We like to go out…when we can, of course! We both work and have responsibilities, so anytime we get a chance to go out on a date we take it! We also are enjoying still being able to go out when we want, we have several friends with children and it is sometimes hard to get together because they have to figure out child care to go out on dates. Even with all that, we still look forward for the day to comes when we will be rambling and trying to find someone to watch our children, but we also like when we can just get in our car and go out. Tonight we went to a restaurant we don’t really go very often but every time we do we think “why don’t we come here more often?” and say that we will go more often, Luna Rossa. This is a small Italian restaurant in the town of Mesilla, which is right next to Las Cruces, where we live. 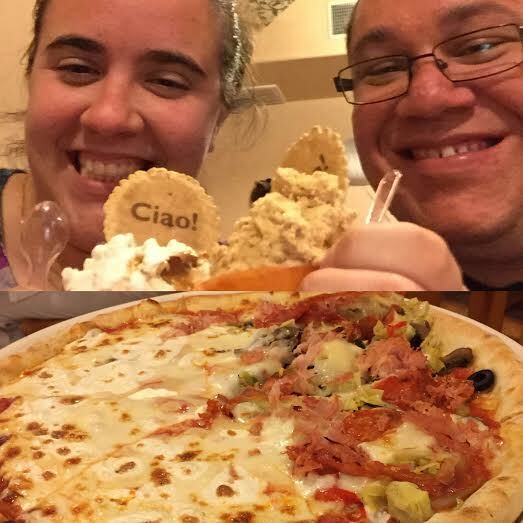 They have some really good pizza, great wine and some of the best Gelato around! – Good food, preferably local. – We also like to travel and go to new places, but financially that is not always possible to do. Just like any other married couple, having fun and just being ourselves is a big part of our relationship and something we will always encourage our future children to do.